Okay, enough of that silliness. First of all, to address the thread title: "Pointless" does not mean "stupid". One of the tenets of Zen Buddhism is that pointlessness means an action is taken purely for the sake of seeing what will happen, rather than trying to achieve a useful productive goal prescribed by best-practices and validated by business metrics. We all need some pointlessness in our lives; that's why we have hobbies. I've always felt like high-flux 5mm LEDs never really got a fair shot at the high-end boutique flashlight market. Arrays of 5mm LEDs persist in the dollar-store flashlight market, but they're long gone from any designs people would pay real money for. 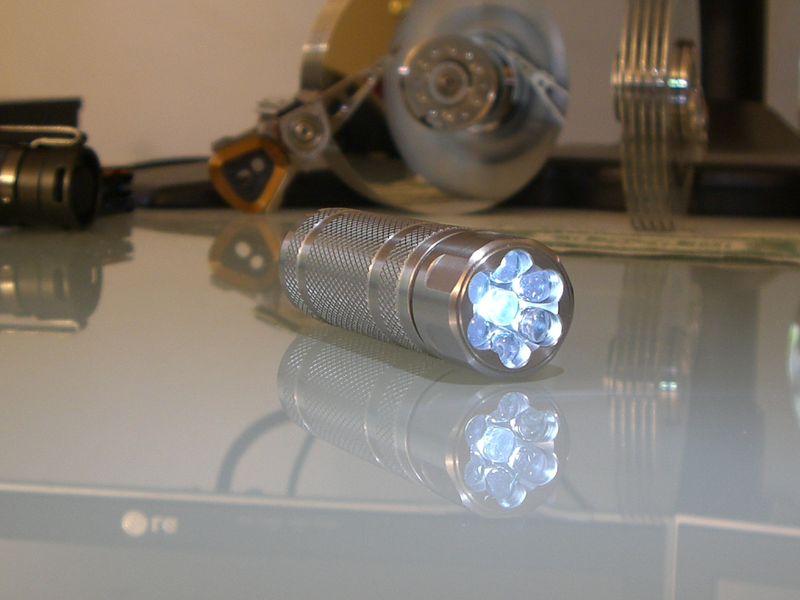 Pretty much the only high-end flashlight I can think of in the past...8 years?...that used an array of 5mm LEDs is the Peak McKinley, which I was fortunate enough to buy in long-wearing stainless-steel just before it was discontinued. It's not surprising. 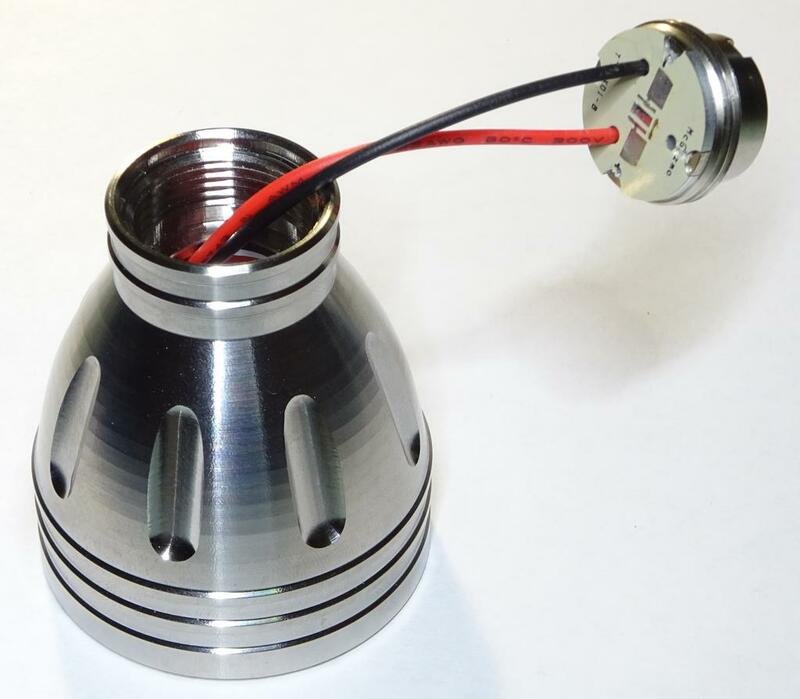 After all, the same technological developments that enabled high-flux 5mm LEDs also enabled even-higher-flux surface-mount LEDs, so we flashaholics went with the design that had more potential, and the rest of the market followed-suit. But I've always thought arrays of 5mm LEDs have a certain charm, kind of like the alternate history of highly-advanced Victorian devices in the steampunk genre, so I decided to make a high-powered LEDpunk flashlight. I know what you're thinking: "Fyrstormer, that's insane! Why would you spend $600 to build a flashlight that isn't state of the art??" Because I got bored, dear reader, and I wanted a new toy. Next question? The result is something that, to me, looks like it belongs in the Large Hadron Collider as a particle-detector grid, or something like that. I know that's just my pride of craftsmanship speaking, but whatever. Next, I added a JST power connector on the back of the board so I could unplug the board from the driver if/when I need to disassemble the head in the future. Then I took 29 of the highest-flux white LEDs I've ever seen -- the same 5-die LEDs that PhotonFanatic uses in his Killer AAA keychain lights -- and cut the wire leads so they would fit in the sockets on the board. 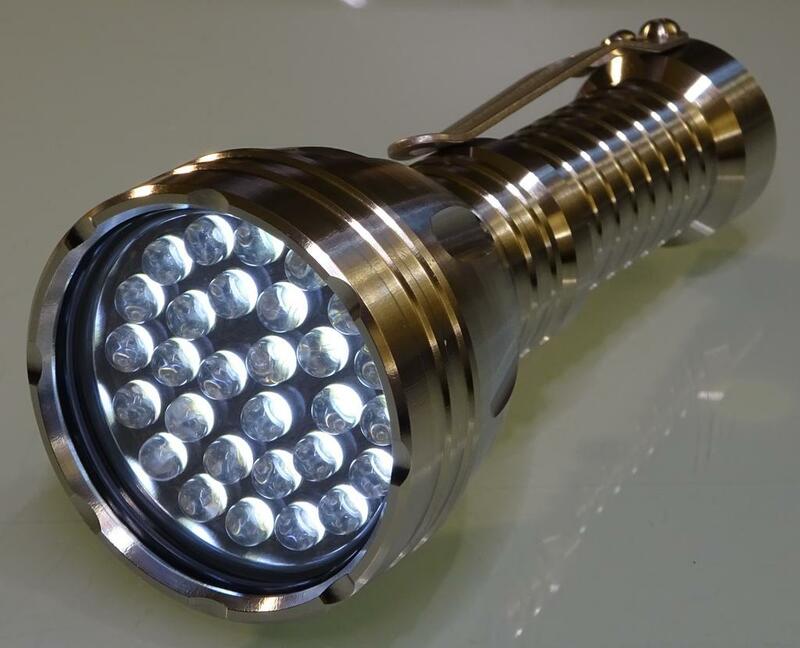 (at 5 emitter dies per LED, that's a total of 145 emitter dies in this flashlight. I wonder if that's a CPF record? ) Then I plugged in all those LEDs, trimmed-down the alignment mask from the original flashlight to help keep the LEDs from getting tilted during installation, and installed a layer of decorative material on top of the mask to pretty-up everything a bit. I can hear you now: "Fyrstormer, is that leather? Did you put leather in a flashlight?" Yes I did. I wanted to give this flashlight that extra luxury touch, so I bought a sheet of nice leather on eBay and cut it to fit using a leather punch and heavy-duty scissors. As a bonus, it also does the same job as the O-rings surrounding the original Makai reflector, keeping the assembly snugly in-place inside the head. I really like the way this whole assembly looks; it's like a layer-cake made of electronics and dead cow. Before installing the driver pill, I pre-twisted the power wires counterclockwise a few turns, so they would un-twist for the first few turns while I was screwing the driver pill into place. That will reduce the likelihood of the wires snapping loose from torsion. If I wanted to do it even better, I would've installed the driver pill before installing the LED assembly, since the LED assembly doesn't need to be screwed into place...but I didn't know if the LED assembly would need modification to fit, so it got installed first this time. As it turns out, the LED assembly fits perfectly into the head with no spacers required to keep it pressed against the glass! I'll take that as a small sign that the universe approved of my idea. I think it's really cool to see all those little wires connecting the 5 emitter dies in each LED to the main power leads. And in case you're wondering, no, it's not on the highest setting. This is brightness setting 2 out of 21, so it's barely bright enough to read a map in the dark -- a proper moonlight mode. I have the HiveLD driver programmed for a max setting of 1.2 amps, which works out to 41.4mA per LED, or 8.28mA per emitter die. I haven't tested its efficiency yet, but it should be pretty good with the power distributed across so many emitter dies, and it's still bright enough to illuminate an entire room by itself. So what does the beam look like on the highest setting? So there you go, that's my first flashlight project in a long time. I think it lives up to the name of Fyrstormer's Evil Labs. Last edited by fyrstormer; 12-02-2018 at 05:13 PM. Nice work. 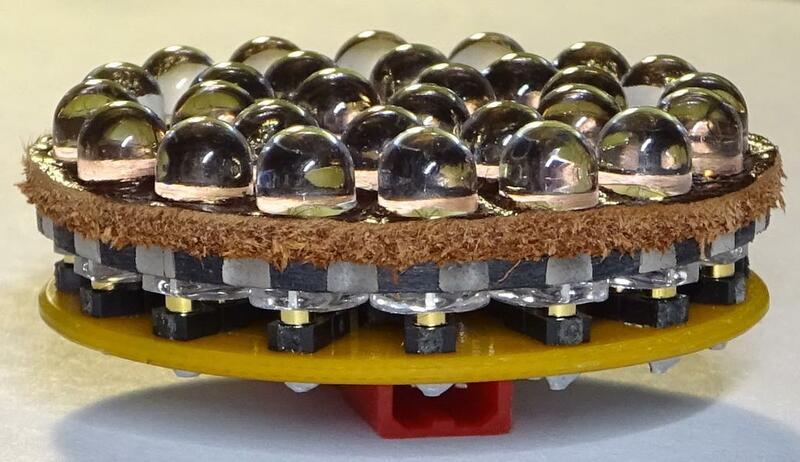 I like the "layer-cake made of electronics and dead cow." "There ain't no bones in a hotdog" F. York. Did you consider Yuji's ? It is a sort of sacrilege, but admittedly an interesting one. 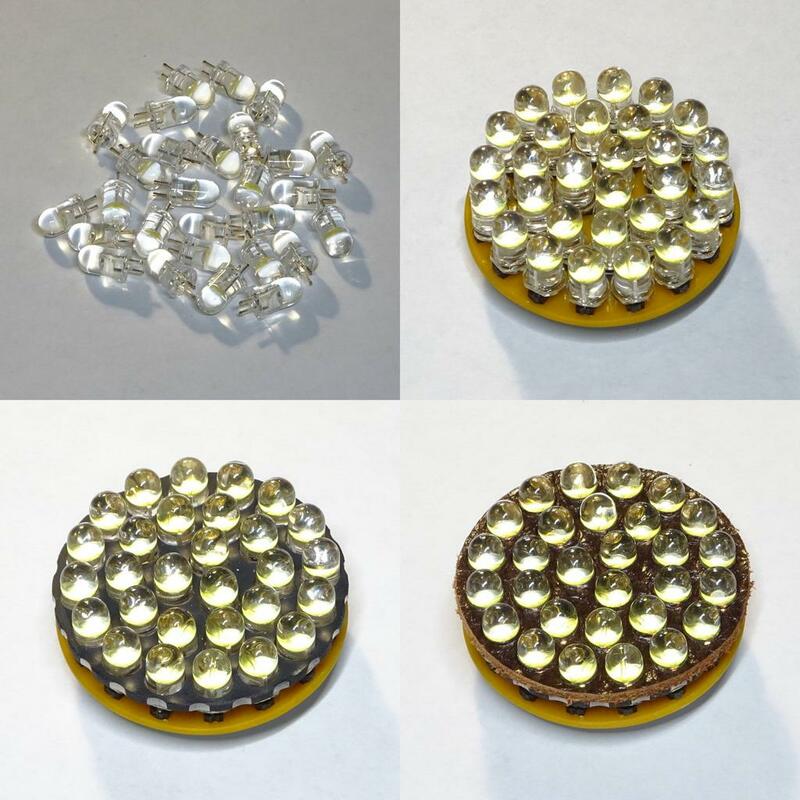 Is the Peak the highest quality 5mm cluster light produce in any significant number? 41 brands, 2124 models and still growing! 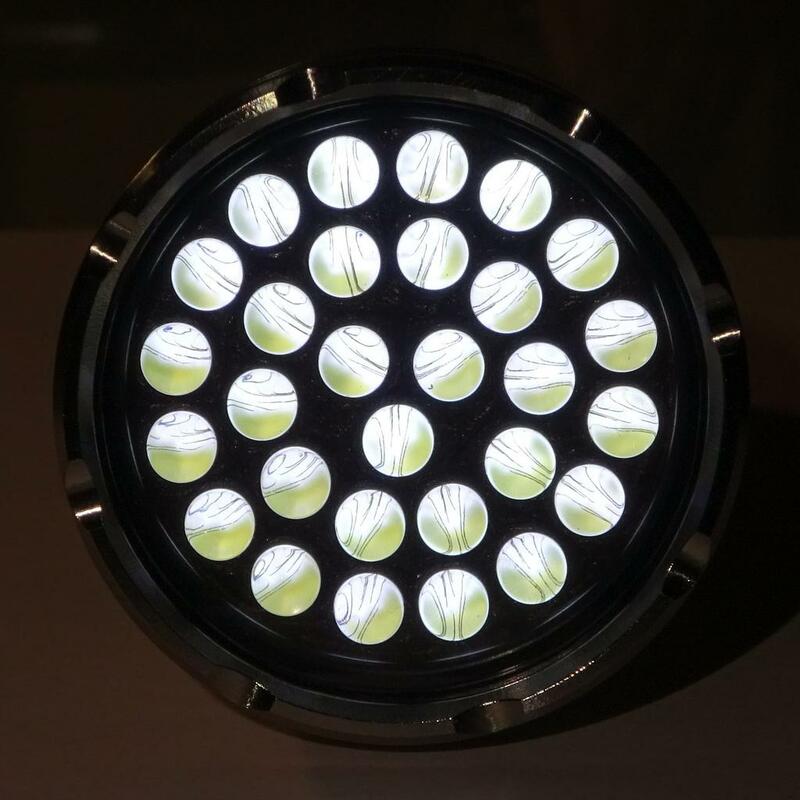 PhotonFanatic mentioned Yuji LEDs in a recent email conversation. He mentioned that Yuji LEDs have better CRI, but I went with the 5-die LEDs for two reasons: 1) I wanted the most lumens I could get, so it wouldn't be disappointing when I turned the light on, and 2) I already had them. 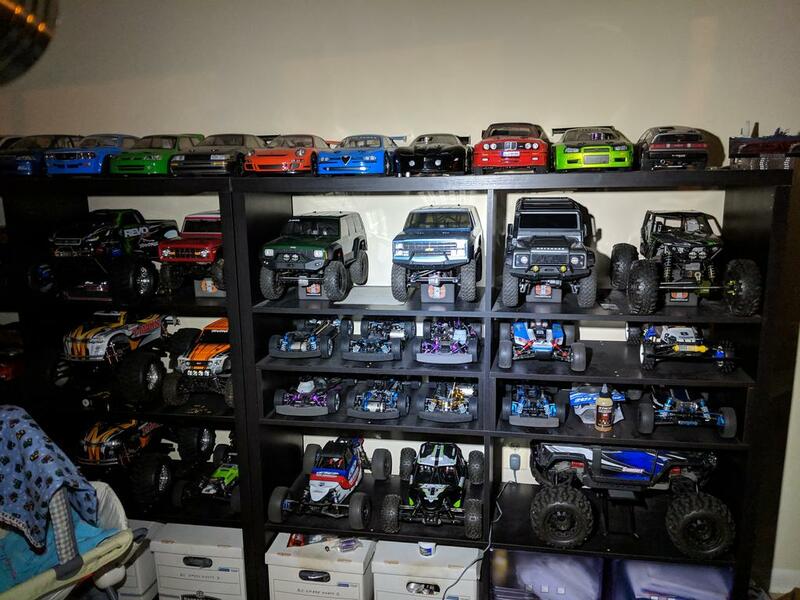 The picture of my RC cars is pretty true-to-life, so I'm content with the CRI of the 5-die LEDs. This is like so forwards but backwards at the same time. I love it!! Who needs to see the light at the end of the tunnel when you have friends on CPF? Wonderful work! What is next? You could have a career in the light building industry, however you would have to quit your job at the CIA. Really, that is some very beautiful work. LOL, me at the CIA. I would go crazy in a day from all the regulations in a place like that. Cool mod! I like the leather touch. Any of you electronic whizzes care to comment on the use of this many LED's in parallel on a constant current driver? I assume that the greater number of LED's the less the impact on an individual LED based on variation in Vf. Is that correct? After seeing a single die in the Luxeon 5W LED's burn out supposedly due to Vf disparity I have tried to avoid stringing any LED's in parallel but I do see it done these days and in high current applications. 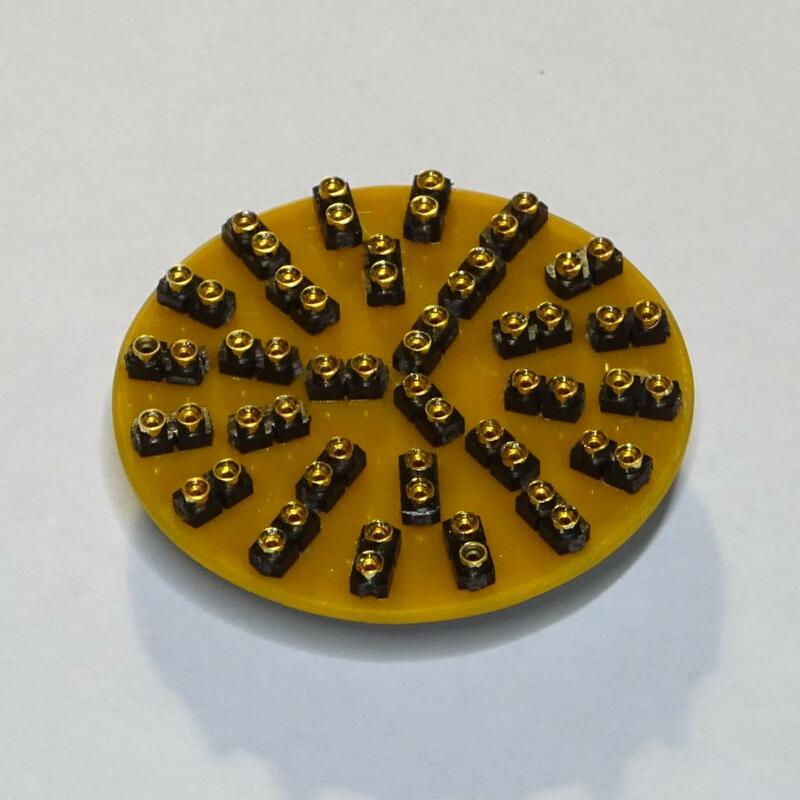 Hypothetically, if you had one emitter die that was a magical superconductor and had zero resistance, all of the current would pour through that one emitter die no matter how many others were connected in-parallel. In reality, each emitter die has nonzero resistance, and that resistance increases as more current passes through it, assuming they are all kept at the same temperature of course. So the current gets split between the emitter dies according to the inverse of their resistances. The possibility of a thermal runaway in a single emitter die exists, but with so little current passing through each emitter die in this setup, the risk of any one emitter die overheating enough to lose significant resistance is minimal. One of the LEDs would have to be defective to begin with, in which case I'd need to replace it anyway. Last edited by fyrstormer; 12-03-2018 at 04:44 PM. Congratulations on a confounding mod. This is really neat. Awesome mod! Once things leave my hands I am not responsible for what happens. this is the most pointless and amazing mod i have ever seen. this is the el camino of mods! LOL, I never thought anything I'd ever do would be compared to the El Camino. my daily driver is a '83 El Camino! 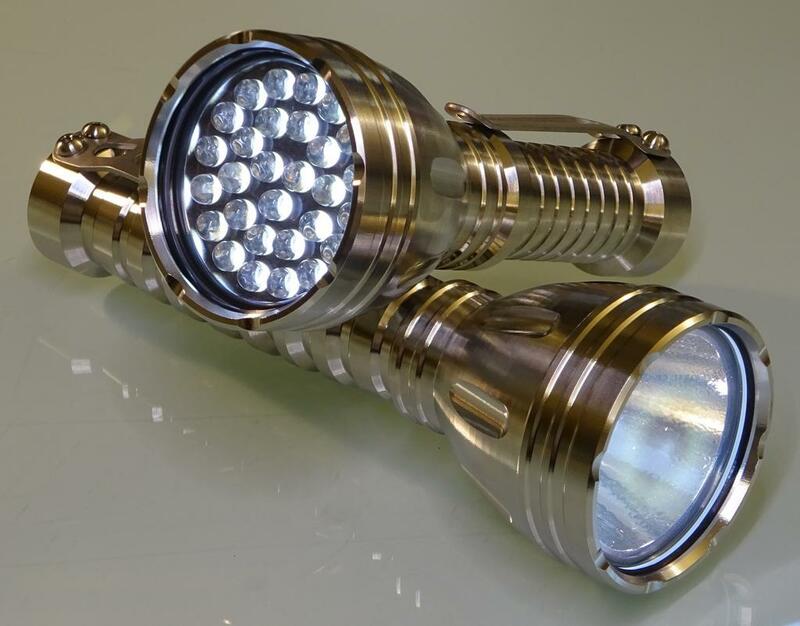 now that you have done this mod, do you have any idea what the lumen output is? is there anything you would have done differently? I'm guessing the output is somewhere in the 250-300lm range, based on ceiling-bounce comparisons with other lights I own that are rated at that brightness, but I don't have the equipment to measure its brightness objectively. If I had it to do again, I'd try to come up with a more elegant way to connect the driver to the LED assembly. I may yet go back and modify the connection to use a barrel plug and socket, so when I screw the driver pill into place, the plug and socket line-up and automatically make a connection. But it's not like I'm going to be disassembling this light on a regular basis, so I may also decide to leave it as-is because it's not a big deal. Great original post, great following thread! Like you, I don't have much need for a thrower in my environment so I am all about flood with my lights but this is the only 5mm "array" light that I have ever had any interest in! I actually dig the clash between the "cheesy tech" of the array packed into the "classy coolness" that is the Makai. Congrats on a very unique and very well executed build, and great photos as always! Unusual mod for a Makai but nice work! Thanks! I wasn't really interested in doing a "usual" mod anyway. I wanted to do something different and interesting.